Debate over land acquisition for “public purposes” has turned into a chasing game for more compensation. There is political competition over which ruling party gives more money as compensation for land. It has become a “we v them” game. In between we have lost track of the key issues related to land acquisition. This long-standing debate never revolved around compensation alone. To begin with, mostly tribals were the victims of land acquisition. So the debate circled around the socio-cultural impacts of displacement. There were talks of whether to acquire tribal land. Tribals continue to be at the highest risk of eviction as their regions have the largest number of pending development programmes. But looking at the present debate it seems land acquisition per se is no longer contested. Rather, it has been made easier with more monetary compensation. What’s more, there is a pan-India generalisation of the relationship between land and its owners. So a relatively rich farmer of Uttar Pradesh or Haryana can become a template for drafting a policy on land acquisition and compensation for the country. This is where the current land acquisition policy may again fail to redress the problems of tribals. 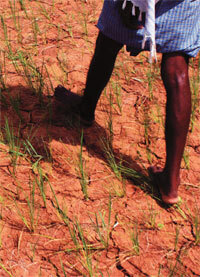 A tribal resident of Jharkhand is no reflection of a farmer in Greater Noida, Uttar Pradesh. But it was his or her long endurance that resulted in redrafting of the land acquisition law, first time in more than 100 years. However, he or she would not be the template for it. Why? There are many reasons but let’s deal with the compensation aspect at the moment. In recent years “market value” has been the government’s parameter for giving compensation for the land acquired. This is precisely what the farmers in Greater Noida were demanding. The state’s new land acquisition policy supported this demand by making valuation a bilateral deal between the people and the companies. Chances are farmers in Haryana, Uttar Pradesh and Punjab will get more than the market value for their land because they have market benchmarks for estimating the “market value”. Consider the value of tribal land. No tribal in the country has sold any land since early 1970s because of laws that stop land alienation. So no tribal knows the current price of his or her land. This gives the government absolute power to decide the “market value”. Ask any revenue official in Odisha, Jharkhand or Andhra Pradesh how they do valuation, the reply is: guesstimate. And invariably this guesstimate is awfully low even for local market. A displaced tribal resident will get this paltry sum to buy land elsewhere where the price will be much higher. He or she will have no option but to pursue daily wage jobs in urban areas. Tribals suffer the most even when it comes to land-to-land compensation package. According to the new land acquisition policy of Uttar Pradesh, people will get 16 per cent of the “developed” land back that can be resold. Can a similar formula be applied to tribal areas? No. The land that tribals get as compensation is in far away places which usually do not have the essential forest and water sources. Government compensation usually does not take care of these common property resources. Over a period of time, the government has recognised individual rights to land in tribal areas, ignoring the communal rights to resources. This is despite the numerous protective laws that intend to retain the traditional tribal communal ownership over resources. In many states, land-to-land compensation is limited to a certain amount of land. For instance, Andhra Pradesh gives land compensation of up to 2.53 hectares. Beyond this the state gives monetary compensation. There is another set of problems with land-to-land compensation. Usually resettlement happens in non-tribal areas, keeping the displaced tribals away from special development programmes. Secondly, land allocated as compensation is either encroached or in litigation, bringing the displaced tribals into conflict with non-tribals. The new Land Acquisition Bill states that land for land “shall be allotted…if government land is available”. The government could effectively get away by not providing many benefits listed in the bill. In fact, most of the safeguards and benefits mentioned in the bill are limited to families affected by large-scale displacements (400 or more families in plains and 200 or more families in hills and tribal areas). Most tribal settlements are in small hamlets. These issues are widely known. But the fear is that with unipolar focus on monetary compensation, these issues will be sidelined. What’s more, a one-size-fits-all policy will perpetuate the historical injustices done to the people who have made way for “public purposes”. I think that while we continually sculpt land acquisition laws, we also need to examine the larger choices this country is making. If we take a sufficiently long-term view, biodiversity conservationists and tribal rights activists are essentially battling the same foe - increasing pressure from the outside(growth of cities) on pockets of lands that are rapidly shrinking. The psychological obsession with GDP growth, coupled with a runaway population growth only point toward one future - that it is only a matter of time, in spite of any sophisticated law that might be in place, before questions of conservation and social justice become even more of an inconvenience than they already are to whatever government is in power. Has not implementation always been a larger problem than the existence of laws? There are two elephants in the room - an exponential population growth and an economic policy that uses that population as justification for its own insane continuation. We continually hear arguments from governments and corporates that development is essential for creating jobs. How much have we challenged this fundamental notion? How much are our educational institutions challenging it? Step into a University campus and you will witness different departments diffusing conflicting ideologies - the engineering or management departments for example talking about growth in GDP terms; only a few departments actually ask more searching questions(even there, only a few individuals do) such as certain arts departments and perhaps at a stretch environmental science? Essentially our educational system has failed us, it leaves vast swaths of our population ignorant of the larger forces affecting everything else. The rot is in our knowledge diffusing systems and not in the fine print of our laws. Unless that changes, nothing else can. I don't mean to sound dismissive of efforts to examine and report flaws in our laws. But the 'we vs them' character of all these debates that the author mentions are a product precisely of our education system that systematically produces 'us' and 'them' every graduating year. We need a simultaneous movement, one that asks larger more fundamental questions of what we value in society in general. And the movement needs to begin in our universities across the board.